Can a solar sail be added to an ion engine and work better? Has there been a concept vehicle that uses both solar sails and ion engines? Does the added mass of each system increase or reduce the spacecrafts total delta V capabilities? As S.F. said the solar sail could be used as a parabolic mirror to direct light onto the electric engine along with providing propulsion. 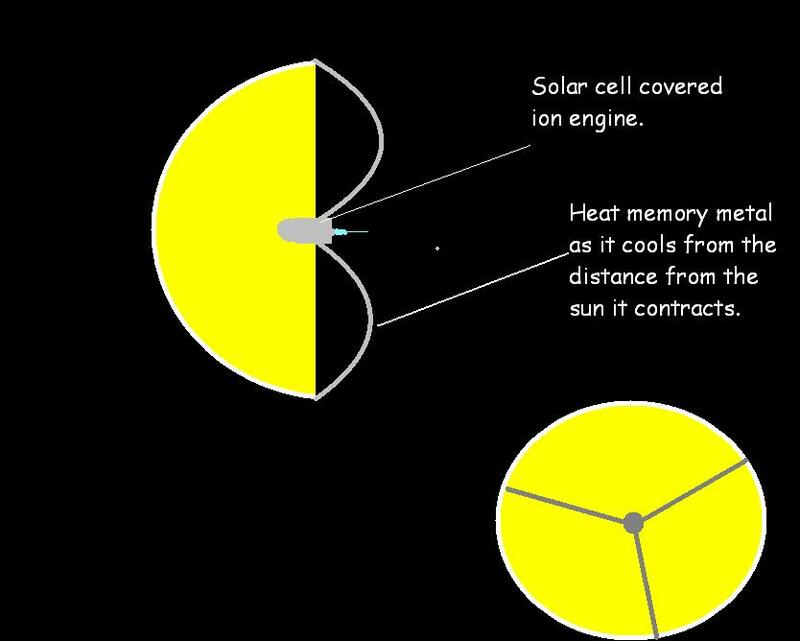 As the engines journey away from the Sun the sail would adjust keeping the ion engine at 100%, but the surface area of the sail will decrease. This is a tricky question, primarily because solar sails benefit from a low mass spacecraft and with the addition of an electric propulsion system, you are increasing the mass decreasing the effective of acceleration and total delta V capabilities. Solar Sails – Solar sails require photons to gain acceleration and as a solar sail propelled spacecraft moves further away from the sun, the sails effectiveness at propelling the spacecraft forward is greatly dimensioned. The supporting systems required to deploy a sail are relatively mass-light compared to chemical or electric propulsion systems. For the solar sail propulsion system, you have the mass of the deployable booms, Mylar sail, deployment mechanism, and sail control system. R = Payload Mass Fraction (mass_1/mass 2), where mass_1 is mass of sail and mass_2 is mass of payload or spacecraft. Electric Propulsion System – These are extremely complex and elaborate systems as their performance is a function of several variables including power, spacecraft mass, engine IPS, etc… While I am by no means an expert in EP systems they do require a lot of supporting systems when compared to a chemical or solar propulsion system. Large power requirements – On average (depending EP system selected) 150W - 2kW of power – Aerojet’s Electric Propulsion Catalog. There are two main options of supplying power. First option is using solar arrays, however they’re power generation drops off at r^2. As an example, you generate 1/27 the power at Jupiter as you do at Earth. The second option is using a radioisotope thermal generator (RTG) which are heavy, extremely expensive, and only produce around 80-120 W and with NASA’s next generation RTG (MMRTG) only capable of producing around 110W, it’s unlikely that an ION RTG powered spacecraft will occur. Requires the addition of propellant tanks and propellant management systems (this includes heaters because fuel must remain at operational temperatures). Additional hardware and electronics to manage the complex electric propulsion system. This brings me to my last point, combing these two systems together brings up new problems of how to manage them independently of each other. When you combine a solar sail and electric propulsion spacecraft, together you need a way to support the solar sails systems as well as the electric propulsion systems (structurally, hardware wise, electrically) and doing this greatly increases the total spacecraft mass and complexity involved. Ultimately it comes down to design complexity and does the added mass of each system increase or reduce the spacecrafts total detla V capabilities. You can play around a view the relationships between the two systems. I am not aware of any designs combining the two concepts. As noted in the various comments there is some overlap in that both are low thrust/continuous operation designs but they have different optimal trajectories so a given craft would generally be better off being lighter and able to optimize for a single thrust type. Ion drive control systems on a massive solar sail might make sense, or if there is some magic fabric that can be both a solar sail and a solar panel. Both would depend on large scale resource extraction in space and are well outside current planning. With the second half of your question most solar sail designs are getting most of the thrust from light though solar wind can play a role was well, in either case thrust would only reduce at some measurable fraction of the speed of light and the very function of a solar sail means it cannot get much above solar system escape velocity (0.001% c) because it leaves the star providing the thrust. A very poorly design mixed thrust craft might collapse the sail supporting structure with excessive forces, but the sail would still be producing thrust during this process. The sail, shaped somewhat like a kite, also has solar cells embedded to generate electricity. It was not expected to make much power during this flight, but more to serve as a test bed for future ion propulsion-engines that not only use solar cells for electricity, but also are moved along by sails. There's some effort to make thin film photovoltaics that enjoy lots of surface area for little mass thus improving the alpha. And for solar sails you also want to maximize surface area while minimizing mass. So the two technologies have goals in common. The Japanese Ikaros was an exciting mission. These are two different types of propulsion systems which are still in theoretical stage and have to go across lot of vigorous research. In my opinion having solar sails and ion engines , provides good acceleration and increases the redundancy of the spacecraft and by the way , yes it is feasible , because ion engines works on the principle of positive charges , while solar sails works due to the solar wind , although there is a chance of interference. Not the answer you're looking for? Browse other questions tagged engine-design solar-power engineering ion-thruster solar-sail or ask your own question. At what size does a bigger solar sail stop increasing your acceleration? Can modified solar sail use Earth's atmosphere to correct an eccentric orbit? Can a solar mirror increase an ion engine 's output? Can solar sail prevent orbital decay? What is the most stable configuration for a centrifugal ship towed by a solar sail? Can an onboard laser propel a solar sail? Thrust vectoring for ion propulsion - any plans or current research? Is there a solar sail design that can deploy and retract at will? Why did Deep Space 1 use solar concentrators?